I used to think they were the same too. But climate is defined as "The meteorological conditions, including temperature, precipitation, and wind, that characteristically prevail in a particular region.". We live in a temperate climate, with cold winters and humid summers. These are the GENERAL conditions for our region. Weather, on the other hand, is "The state of the atmosphere at a given time and place, with respect to variables such as temperature, moisture, wind velocity, and barometric pressure." So if you want to know what it's like at the Petroglyphs NOW, you want the weather. If you want to know what it is USUALLY like, you want the climate. In addition, here are the current satellite images of the Petroglyphs area. 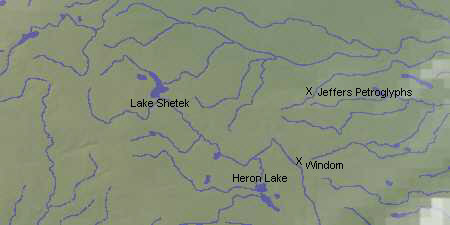 The map below shows the location of the Jeffers Petroglyphs, the city of Windom, and two area lakes for reference.